Is Human Interaction an Endangered Species? Is human interaction an endangered species? Every industry is trying to replace people with technology. This isn’t exclusive to ecommerce, but retail as well. You now see fewer clerks and more self-serve checkouts. According to Michael Chui, a partner at the McKinsey Global Institute, mentioned in an article by Ilan Mochari, Why Retailers Won’t Nix the Human Transaction, your retail future is unlikely to include actual point-of-sale (POS) transactions. Someday in the not-too-distant future, Chui says a Customer will be able to walk into the store, grab what she wants and simply leave. Chui says, “You grab a pair of shoes and you just walk out.” Chui also predicts that through a population of sensor technologies placed strategically within stores, retailers will recognize Customers when they walk in the door through smart devices or other means. Stores will have payment cards on file; Customers will be billed when they leave the store with the merchandise, essentially bypassing the checkout. Interactions trump transactions – Regardless of technological advances, people need people for information, education, conversation, and most of all, an emotional connection. The bells and whistles are nice; however, relationships will always be the key differentiator in the Customer experience. The 2014 Secret Service Summit – In 2009 The DiJulius Group launched the Secret Service Summit and today it is the #1 Customer service conference in the world. The Secret Service Summit is a two-day conference featuring the top Customer service speakers, authors, and brand executives. This event will sell out! 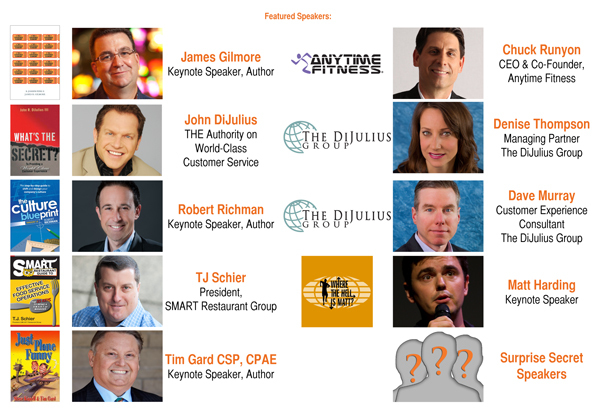 Join the revolution – The DiJulius Group has created the #1 Customer Service Conference ever produced. The next Secret Service Summit will be held this November 5th & 6th in Cleveland, Ohio. This is a two-day, international seminar dedicated exclusively to world-class Customer service. There will be more than 10 presenters over two days sharing their different expertise at this year’s event. The lineup includes respected authorities, authors, consultants, and top-brand executives who run world-class Customer service organizations. They know how to provide superior Customer service while still operating a growing and profitable business in today’s economy. 2014 Secret Service Summit: the 2014 Secret Service Summit is guaranteed to be the best ROI of any professional development training/seminar you have experienced. The Secret Service Summit will enable your management team to return with a solid plan to take your company’s Customer experience to the next level and make price irrelevant.